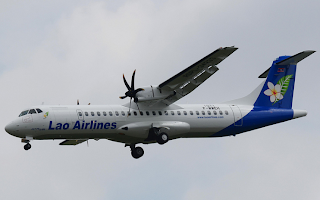 Home Unlabelled Bad weather blamed for Laos Airlines ATR72 - 600 crash, 44 passengers and 5 crew killed. Bad weather blamed for Laos Airlines ATR72 - 600 crash, 44 passengers and 5 crew killed. An ATR 72-600 operated by Lao Airlines was involved in an accident on Wednesday at around 4.00 pm (local time) near Pakse (Laos). The flight QV301 was operating between Vientiane and Pakse with 44 passengers and 5 crew members on board. All 49 people on board were killed. According to ATR press release, the aircraft registered under RDPL-34233, was MSN (Manufacturing Serial Number) 1071, delivered from the production line in March 2013. Though at this time, the circumstances of the accident are still to be determined, official sources of Lao Airlines declared that the aircraft ran into extreme bad weather conditions and crashed into the Mekong river. According to Reuters, strong winds from the tail end of the Typhoon Nari have been passing over the area making it difficult task for divers trying to retrieve bodies from the muddy river. Bodies that have already been recovered were laid out at a nearby temple. Officials in Laos announced that 17 bodies have been recovered from the site. Investigators seat through the wreckage to determine the cause of the crash that killed nationals of ten countries ranging from Australia to France. An aircraft ATR72-600 is a 68-to-74-seat twin turboprop engine aircraft and was a brand new aboard Lao airlines' fleet.